This 4 bedroom 3 bathroom home is located on the community of Sandy Ridge and will accomodate up to eight guests in comfort. The fully equipped kitchen has a breakfast bar that seats two people and breakfast table that seats a further four guests. The home features two living areas and a dining table that seats six people. The bedrooms consist of two ensuite bedrooms and the two twin rooms share the third bathroom. The games room features a pool table, table tennis and football table. There is internet throughout the home for guests to use. Outside you will find your own pool, spa and sundeck that is furnished with outdoor pool furniture and overlooks conservation. 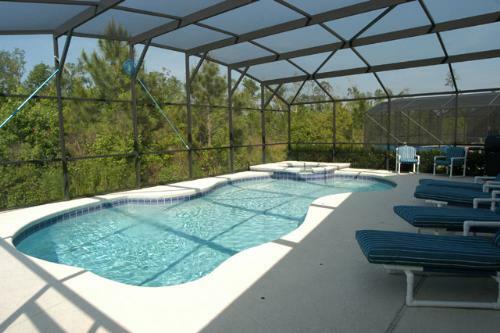 There is also a furnished lanai for extra shade. 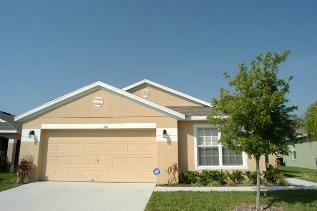 Sandy Ridge is a peaceful and well maintained community surrounded by conservation and woodland. The community is located just minutes from Junction 58 of the Interstate 4 which provides easy access to all the main attractions that Orlando has to offer. Walt Disney World is approximately a 15 minute drive away and ChampionsGate which boasts two golf courses designed by Greg Norman are within a 5 minute drive. Within a couple of minutes drive guests will also find a Publix supermarket, McDonald’s, Subway, a gas station, banking facilities and other small retail outlets. Sign up for our latest offers, news, and tips.